2013 was an incredible year for neuroscience in which a number of truly groundbreaking studies revealed many new insights about the inner workings of our minds. Some of these discoveries in and of themselves are significant enough to create entirely new fields of research within the larger field of neuroscience. What’s truly remarkable about the studies listed below is that their findings are quite tangible for anyone looking to ‘optimize’ their lives and better understand how their own minds work. Simply by browsing through the summaries of the research it is possible to find many ways you can immediately begin to substantially improve your life. Perhaps this is why neuroscience is such an exciting field — the resulting data is typically extremely practical and leads to truly actionable items we can immediately use to create better lives for ourselves. Perhaps one of the most defining features of humanity is our capacity for empathy — the ability to put ourselves in others’ shoes. A new University of Virginia study strongly suggests that we are hardwired to empathize because we closely associate people who are close to us — friends, spouses, lovers — with our very selves.”With familiarity, other people become part of ourselves,” said James Coan, a psychology professor in U.Va.’s College of Arts & Sciences who used functional magnetic resonance imaging brain scans to find that people closely correlate people to whom they are attached to themselves. The study appears in the August issue of the journal Social Cognitive and Affective Neuroscience. In other words, our self-identity is largely based on whom we know and empathize with. Coan and his U.Va. colleagues conducted the study with 22 young adult participants who underwent fMRI scans of their brains during experiments to monitor brain activity while under threat of receiving mild electrical shocks to themselves or to a friend or stranger. The researchers found, as they expected, that regions of the brain responsible for threat response — the anterior insula, putamen and supramarginal gyrus — became active under threat of shock to the self. In the case of threat of shock to a stranger, the brain in those regions displayed little activity. However when the threat of shock was to a friend, the brain activity of the participant became essentially identical to the activity displayed under threat to the self. A new brain connectivity study from Penn Medicine published today in the Proceedings of National Academy of Sciences found striking differences in the neural wiring of men and women that’s lending credence to some commonly-held beliefs about their behavior. Although sleep requirements vary from individual to individual and across species, a complete lack of it is deadly. But no one knows why. To test the detox power of sleep, the group demonstrated that a protein fragment called β-amyloid, located in the interstitial space, disappeared faster while animals were sleeping. β-amyloid is best known as a component of amyloid plaques in association with Alzheimer’s disease. Chances are, you’ve heard the label of being a “right-brained” or “left-brained” thinker. Logical, detail-oriented and analytical? That’s left-brained behavior. Creative, thoughtful and subjective? Your brain’s right side functions stronger — or so long-held assumptions suggest. Following a two-year study, University of Utah researchers have debunked that myth through identifying specific networks in the left and right brain that process lateralized functions. Lateralization of brain function means that there are certain mental processes that are mainly specialized to one of the brain’s left or right hemispheres. During the course of the study, researchers analyzed resting brain scans of 1,011 people between the ages of seven and 29. 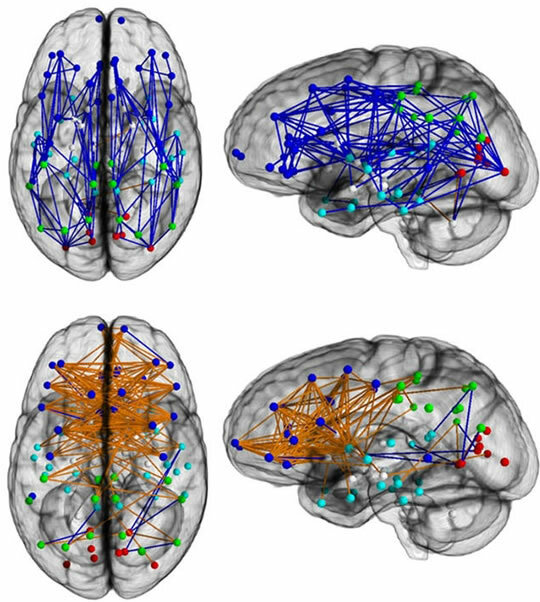 In each person, they studied functional lateralization of the brain measured for thousands of brain regions — finding no relationship that individuals preferentially use their left -brain network or right- brain network more often. A recent study by researchers in Germany has suggested that night owls have a decreased amount of white matter in their brains compared to people who go to bed early. White matter is insulated and transmits nerve signals around the brain. In this study three classes of chronotypes were analysed; early (EC), intermediate (IC) and late (LC). Chronotype simply refers to the body clock of an individual, the time physical functions or change occur (eg; eating, body temperature or this case sleeping). ECs wake up early and go to bed early where as LCs go to bed late and sleep into the day. There are many factors that are believed to contribute to the sleep chronotype of an individual. Young adults with high testosterone levels (mainly males) are more likely to go to bed late where as those with low testosterone levels (mainly females) are more likely to go to be earlier. This preference also varies with age, young people tend to sleep in where as elderly people wake up earlier. Well it has been shown that depressed individuals exhibit abnormal white matter levels in their brains, specifically in the anterior cingulate gyrus (ACC) and the corpus callosum. The study showed a correlation between chronotype and white matter composition in the left ACC corpus callosum. LCs were found to have decreased amounts of white matter in these regions compared to ECs and ICs. It is thought that the decreased white matter due to their lifestyle choices puts them at a higher risk of depression amongst other bipolar disorders. We sought to demonstrate that it is possible to send information extracted from one brain directly to another brain, allowing the first subject to cause a desired response in the second subject through direct brain-to-brain communication. A task was designed such that the two subjects could cooperatively solve the task by transmitting a meaningful signal from one brain to the other. The experiment leverages two existing technologies: electroencephalography (or EEG) for noninvasively recording brain signals from the scalp and transcranial magnetic stimulation (or TMS) for noninvasively stimulating the brain. The task that the subjects must cooperatively solve via brain-to-brain communication is a computer game (Figure 4). The task involves saving a “city” (on the left) from getting hit by rockets fired by a “pirate ship” from the lower right portion of the screen (depicted by skull-and-bones). To save the city, the subjects must fire a “cannon” located at the lower center portion of the screen. If the “fire” button is pressed before the moving rocket reaches the city, the rocket is destroyed (Figure 5), the city is saved, and the trial ends. To make the task more interesting, on some trials, a friendly “supply plane” may appear instead of a pirate rocket and move leftwards towards the city (Figure 6). The subjects must avoid firing the cannon at the supply plane. The results suggest that information extracted noninvasively from one brain using EEG can be transmitted to another brain noninvasively using TMS to allow two persons to cooperatively solve a task via direct brain-to-brain transfer of information. The next phase of the study will attempt to quantify this transfer of information using a larger pool of human subjects. University of Arizona researchers have found in a recent study that ultrasound waves applied to specific areas of the brain appear able to alter patients’ moods. The technique could one day be used to treat conditions such as depression and anxiety. With research committee and hospital approval, and patient informed consent, Dr. Stuart Hameroff, professor emeritus of the UA’s departments of anesthesiology and psychology and director of the UA’s Center for Consciousness Studies, and colleagues applied transcranial ultrasound stimulation (TUS) to 31 chronic pain patients at The University of Arizona Medical Center-South Campus. This was a double-blind study (neither doctor nor subject knew if the ultrasound machine had been switched on or off). Patients reported improvements in mood for up to 40 minutes following treatment with brain ultrasound, compared with no difference in mood when the machine was switched off. The researchers confirmed the patients’ subjective reports of increases in positive mood with a Visual Analog Mood Scale, or VAMS, a standardized objective mood scale often used in psychological studies. “Sticks and stones may break my bones, but words will never hurt me,” goes the playground rhyme that’s supposed to help children endure taunts from classmates. But a new study suggests that there’s more going on inside our brains when someone snubs us — and that the brain may have its own way of easing social pain. The findings, recently published in Molecular Psychiatry by a University of Michigan Medical School team, show that the brain’s natural painkiller system responds to social rejection — not just physical injury. What’s more, people who score high on a personality trait called resilience — the ability to adjust to environmental change — had the highest amount of natural painkiller activation. The team, based at U-M’s Molecular and Behavioral Neuroscience Institute, used an innovative approach to make its findings. They combined advanced brain scanning that can track chemical release in the brain with a model of social rejection based on online dating. The work was funded by the U-M Depression Center, the Michigan Institute for Clinical and Health Research, the Brain & Behavior Research Foundation, the Phil F Jenkins Foundation, and the National Institutes of Health. They focused on the mu-opioid receptor system in the brain — the same system that the team has studied for years in relation to response to physical pain. Over more than a decade, U-M work has shown that when a person feels physical pain, their brains release chemicals called opioids into the space between neurons, dampening pain signals. Study participants’ brainwaves indicated that even if a person never consciously recognized the shapes on the outside of the image, their brains still processed those shapes to the level of understanding their meaning.